The Pazoda 2 Plain Edge Smaller Knife from Columbia River is a sleek, versatile and resilient folder that does not sacrifice function for fashion. Its smooth 8Cr14MoV steel blade and stainless body offer a brilliant shine that still cuts as deep as the most rugged field knife. Both the blade and the body are coated with a titanium nitride finish to eliminate the threat of corrosion and elemental damage while preserving the knife's elegant aesthetic. The handle is flat and offers ample room for printing and personalized engravings, making the Pazoda 2 perfect for gifts and special occasions. 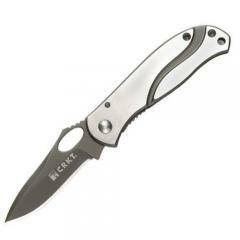 A reinforced steel pocket clip ensures the knife is always close by and ready to impress whoever is near.